Sometimes all it takes is hanging out at the battered old wooden table of a Parisian café with my trusty notebook and a cup of coffee, taking in the local scene. 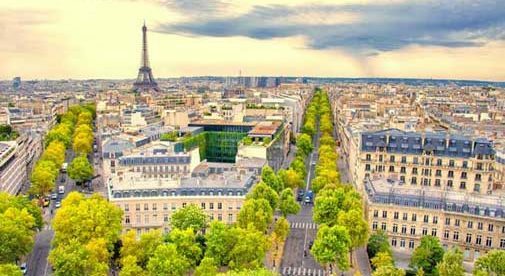 Other days, I love nothing better than wandering the city, taking in the majestic beauty of the Hôtel de Ville or sinuous curves of the Seine the wonder of a first-time tourist. But it’s always a treat to indulge, for a day or so, in the Parisian life that some people imagine that I’m living: lunching at chic restaurants, hobnobbing with beautiful people, and drinking lots of champagne. So, when a friend from Germany suggested that we have a ladies’ weekend somewhere in France, I proposed that we spend the weekend exploring Paris. An ardent Parisphile, she leapt at the chance and vowed to organize the Parisian weekend of my dreams. And so she did. Although Paris has some 130 museums, I tend to drift to my favorites—the Picasso museum, Centre Pompidou, Musée d’Orsay—again and again. But my friend had other plans. After arriving by train in Paris, she promptly whisked me off to the cosy, elegant Musée National Gustave Moreau, a 19th-century symbolist painter, whose style is said to be a precursor to Surrealism. Set in the artist’s former home on a quiet street in the 9th arrondissement, this national museum offers an intimate artistic experience. The $6 admission charge lets you explore this fascinating museum, almost exclusively filled with Moreau’s work, from small watercolors to huge oil paintings. I enjoyed his strange and dark style, but even if you’re not a fan of Symbolism, you may still appreciate the close-up glimpse into the artist’s life as you admire his private apartments and atelier (studio), which feature stunning architectural touches. After leaving the museum, it was time for a little shopping. We headed toward the chic boutiques around Rue Richelieu and lining the elegant 17th-century arcades of the Palais Royal. In all my time in Paris I’d hardly set foot in these shops, which were filled with the kind of sophisticated haute-couture more suitable for a catwalk than pounding the Parisian pavements. But it was fun to admire the fashions…and I did discover a gorgeous jasmine-scented fragrance at Maison Margiela that made me feel as pampered as a supermodel. Next, we strolled the dusty, tree-lined lanes of the Palais Royal, as did Marie Antoinette, once upon a time. Since it was growing cool, we stopped in Café Kitsuné for a $5 cup of hot yuzu, a drink made from the rind and juice of a Japanese citrus fruit, mixed with honey. Delicious. After a little more shopping, we headed to the Hôtel Bachaumont in the 2nd arrondissement near the historic market street Rue Montorgueil for a glass of champagne before dinner. Noticing that everyone in the hotel seemed exceptionally beautiful, we realized that fashion week in Paris was just about to start and this hotel was a hot-spot for fashionistas. Champagne drained, we headed back out for dinner at Ellsworth, an “neo-bistro” that serves up tapas-style dishes. Here, the menu often changes, but you can usually find exquisitely-prepared concoctions such as seared duck breasts, roasted artichoke, and carrots, or fried chicken with cabbage for an average of $16 per plate. We shared about four plates, including dessert, and resisted the temptation to lick our empty dishes once done. We ended our day with drinks back among the beautiful people at the Hotel Bachaumont. We were tired but content to know that our luxurious Parisian weekend would continue the next day with a pedicure and massage at Free Persephone, the Fragrance Day Spa. Hey…if you’re living in Paris, you might as well live the high life once in a while! Since leaving our all-American life in 2013, with three kids in tow, my husband, Ron, and I have spent time in 28 countries and counting. More than half of our time wandering the globe has been rent free, which saves us an average of $2,500 a month…approximately what our home in Seattle, with utilities, cost monthly. Dreaming of retiring in France? I’m not so sure that’s a great idea. There are many potential problems that can arise from living here—issues that you’d probably never considered before. The arguments that can arise! The hidden costs!